Time management seminars are no longer state-of-the-art. Executives throughout the world are now profiting from time optimization. Hailed by academia and the media as “the essential step above positive thinking,” Optimal Thinking empowers you to rise above time management to optimize – not just manage or improve – your time management and effectiveness. 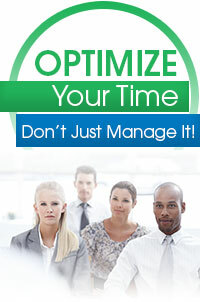 Unlike the typical time management seminar, the Optimize Your Time Management seminar has a fail-safe foundation. You identify the thinking that stops you from being your best, and learn to employ Optimal Thinking consistently. Once you clarify your purpose and highest priorities, you can set your SUPREME goals. You will create your Optimal plan and learn how to best overcome procrastination, minimize distractions, obstacles and roadblocks. You will then discover how to make best use of your daily calendar, email communications, and other online resources. If you are ready to learn how to consistently take the most productive actions to achieve what is most important, this seminar is for you! One-on-one time optimization executive coaching is best used to assess, monitor, and optimize productivity issues as they arise. Executives choose this coaching program to get the most done in the least time with the least stress. They deploy optimum time management strategies and then achieve balance in their personal and professional lives. Our executive coaching will enable you to maximize your management and leadership development. You will resolve the specific issues that compromise your optimum performance. We arrange virtual coaching (telephone calls and video conferences) or office visits at your convenience.